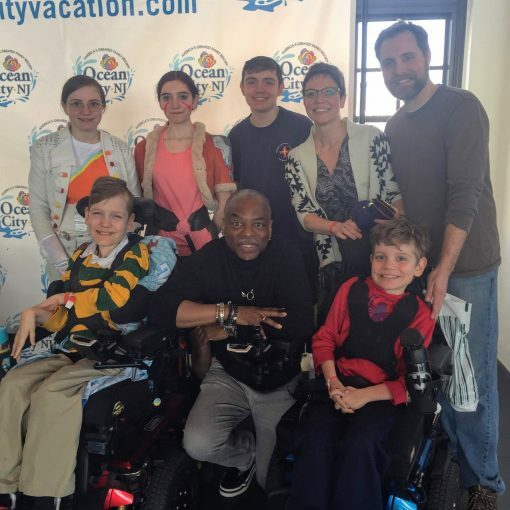 Last weekend we went to Ocean City, NJ for a Comic Con type event and while I was excited to see LaVar Burton, I’d assumed a photo op would be out of our price range. Thankfully, I was wrong! We had great weather all weekend and we really enjoyed the convention. I like the smaller venues, and given the location, we could attend the talks we wanted, and then take a break on the boardwalk, before heading back inside for more events. Fun fact: LaVar Burton attended seminary and considered becoming a priest before deciding he wanted to become an actor. Look how excited they are to be winners!!!! WOOOOOOOO!!! I don’t know how making costumes became a “thing” for me when the kids were little. I just remember for a few years Addie requested costumes we saw in ‘Family Fun’ magazine. And then I started making more elaborate costumes for Byron, then Edie, and so on. I couldn’t make super awesome costumes for everyone every year, so some years the kids had to do more work on their own. I guess Tony’s sci-fi / comic influence and then Addie’s interest in magna transitioned us from just a homemade Halloween costume family to a cosplay family (except that Tony and I don’t usually wear any costumes- though perhaps that will change one day). The older kids now pick and make the majority of their costume pieces. I help by suggesting how to sew or alter clothing from Goodwill, or construct armor pieces from cardboard and spray paint. I also let them know that yes, hot glue will work for this, but dear God no! Don’t use hot glue on that!!! 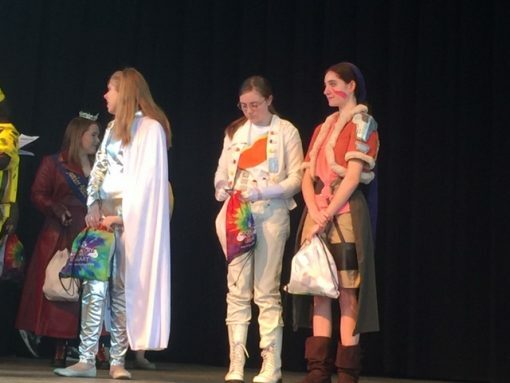 It’s been a real treat to see them continue to make costumes beyond those early trick or treating years, and now, earn recognition for their handiwork. Sunday I also went to confession and got back on track FOR REAL for Lent. It was a good spiritual boost and I’m hoping to sprint across the finish line into Easter, rather than crawl. If you’ve given up on Lent- get to confession and try again! You still have time and even a week and a half of effort is worth it! Here’s my weekly take on my conference ‘Accepting the Gift’ – BUY TICKETS NOW! It occured to me that I never specified that people need to buy tickets in advance as seating is limited, and tickets will NOT be sold at the door. So, I’ve been puting the word out this week and I hope you will snap up a ticket soon. Even if you’re not a special needs parent, help me spread the word so your friends and family who are won’t miss out. Thank you! I’d like to say, I’ll just give up Facebook or Instagram, but if I have an account, I’m going to check it. For some accounts I can just remove the app from my phone, others I need to delete entirely. It’s the same with sweets in Lent, I simply can’t have them in the house. THEY MOCK ME. I can’t eat one of something; once the bag is open, I will eat them ALL. After the 30 days, I will see what I want to restart. I will continue to blog on Fridays and I will put out at least one newsletter in May. I’m not sure if the lack of social media interaction will make me want to write more on the blog and newsletter, or not. I also know I’m awesome at finding other ways to distract myself from writing important stuff so I might take up some exciting new hobby or undertake some new renovation project as well. So anyway- this is your heads up. I don’t want people emailing me asking if I hate them because they can’t find my profile or page on FB anymore and they want to know why I blocked them. I’ve already got my summer planned through the first weekend in August. I know for most people, summer starts with Memorial Day weekend, but for me, it’s starts with MDA camp in June. Both boys are going back for another week of fun and not being taken care of by me! Tony and I might go to Atlantic City, but we’re kind of thinking of staying put in our sweet new house. We’re also taking another road trip to the midwest to visit with Tony’s extended family. It’s been a couple of years, so we’re all eager to catch up with aunts, uncles, and cousins. However, Tony and I were concerned since the boys have grown heavier since our last midwest visit. Combined with Fulton’s new transfer needs, I feared trying to stay with family would not work as easily as in the past (and by “easily” I mean, we could make it work with lots of lifting and cursing on my part). I decided to check Airbnb on the off chance we could find an accessible home central to Tony’s relatives and low and behold I DID!!!! Not only is it large enough for our family and is completely wheelchair accessible, it was super affordable, so we could reserve it for our entire trip. I felt a huge weight lifted off my shoulders knowing that our morning and evening routines would now be 100 times easier than what I had been expecting. How was your week? Write is down it down in seven and then link it up below. Be sure to include a link back to this post so your readers can find the rest of the Quick Takes. I look forward to reading your posts! That is so awesome! Congratulations to Addie and Edie! I’m just starting out on the Halloween costuming adventure with my kids and my crafting skills are definitely not above average… but hopefully they’ll get better with time. Oh gosh, finishing Lent well. Yup, that’s where I am right now too. 🙂 Lent’s been sort of meh. I mean, I moved, which is its own penance, and I’m writing the book, but yeah, it hasn’t been the way I wanted it to go. Oh well. I can finish well, right?! If I ever write a book, I will need to get off all social media for sure. So excited for you. What a full year! Next Post Good Friday- No Quick Takes!